Thanks, Angie! I'll never be without a proper cup of tea again! Enjoy your tea. Well isn't that the loveliest tea travel kit! You've thought of everything, Jean, and you will make some lucky person a very happy winner. I'll drink a sip of tea to that! Happy New Year blessings to you! A perfect size for my small apartment and also for traveling. I can picture this in my cabin on my next cruise. Thanks, Kitty! I hope all my tea friends who travel will put one together for their next trip. Yes, cak813, I hadn't thought of that, in your cabin on a cruise! You must be the healthiest person on the planet, given the good press of tea. But then, what does that make me? Doctors give me rave reviews, and I hate tea. Maybe carrying a tea kit on trips will bridge the gap. I could put all those little skin lotion samplers they stock hotel rooms with in the pot and carry vitamins in the tea tin. Naw. I shall abstain from the giveaway. I do feel a smidgen healthier, however, just reading your column. Pip, pip! Oh yes, I bring tea things when we travel to Florida for a month but on a grander scale with my own kettle, 6 cup teapot, cup and saucer, mug, local honey in a squeeze bear container and lots of different teas. Familiarity makes for a comfortable and special for me tea. I use a stovetop kettle but have been reading about the benefits of an electric one - faster by far to boil the water. I'm in Canada but can think of a number of tea friends who would love to win your giveaway Jen and your idea of surprising someone with this gift is an awesome idea. Sully, perhaps you could use the kettle for melting down coffee ice cream in a hurry? :D Much as a I recommend tea, I wouldn't want to mess with your regime when it is so clearly working for you! Judith, I'm so glad you can enter this one! It's been decades since I last went somewhere for an entire month -- that would definitely call for the full-on tea gear! Koleka, you are so right about that. And coffee-flavored tea is not a good thing! I'd love to take this to Israel with me! Such a fun giveaway! Thanks, Regan! I must see Israel one day! Martha, just take a coin along to turn the button on the bottom of the kettle to the higher voltage and use your adapter plug. So easy even low-tech little me can handle it! Have a wonderful 2017 (and I'll want to hear all about your trip to England!). Oh, please enter my name! We did not have power for several days after Hurricane Matthew and I remember thinking how much I wanted a hot water kettle that would plug in my car so I could have tea! What a useful giveaway. Nita, this would have been just the thing! It's the perfect emergency kit kettle! I am so glad you popped into my blog and left a comment! It gave me a chance to come meet you. I have spent some time browsing your blog. Your recipes sound wonderful. I love this travel tea kit! I would take it with me whenever I travel, but I a hoping my next trip will be to Charleston, SC this spring. Be blessed Jean! You really should consider the I Want to Give You a Bear Hug book. It's really adorable. Penny, thank you! Oh to be in Charleston in the spring! I'm going to be so jealous. I've always wanted to go there. Maybe this will be the year I do. Thanks, Laura. Those all sound like good choices, but I'd probably go with either Vermont or upstate New York. Colorado is gorgeous, too, but I can't do high altitudes. What a wonderful giveaway! I can never wait for breakfast, but need my coffee right away, even when traveling. Besides, restaurant coffee is made for the masses. Lol. But because I would feel guilty using it for coffee instead of tea, I will pass so it can go to a true tea lover. Judy, you can use the kettle for coffee as well. Just take a little pour-over coffee setup instead of the tea things! Vicky, I'm glad you like it! It IS cute, isn't it! I would take this camping! Happy New Year and Hot Tea Month, Jean! Love your tea travel kit! Such a cute idea! Thanks, Margie! Wishing you a wonderful 2017 and happy Hot Tea Month! Thanks, rusthawk! I need to get a lighter tray for my kit, but other than that, it's perfect for me. What a wonderful giveaway. I'm in Canada, but I can think of a few US based friends who love their tea! I'm inspired to make up such a kit for myself! I get to travel quite a bit but I would be just as happy to stay in my own comfy environment with an individual guilt free serving size. I do like an afternoon cup of tea with a cheese and pickle sandwich. Thank you for such a lovely giveaway opportunity! I just love the whole Tea Travel Kit! It is really nice! Annamarie, what a wonderful road trip you have planned! Wishing you a safe and fun trip! Lorrie, thank you. I'm glad you like my kit! And this kettle would make a lovely gift. Nancy, you can sign me up for an afternoon cup of tea with a cheese and pickle sandwich! Karenann, thank you. Glad you like my kit! But I do need to get a lighter tray. We will be living in our camper for a few months to visit family this summer. This would be a big help in a small kitchen with few of my tools. Oh, Leslie, how fun! Yes, this would be perfect for camper life! 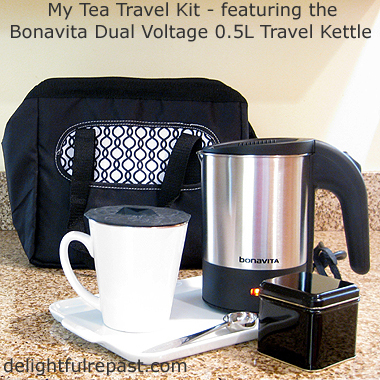 I would love to use this Bonavita Travel Kettle on a trip to see my mom and brothers in Ohio. It's a long trip from here in southeastern NC, and we stay in a motel once on the way there and once on the way back. It isn't an exotic place, but it's family, and I love them. Thank you for the opportunity to win. Fonda rush88888 at gmail dot com Happy New Year to you! Thanks, rush. I hope you have a wonderful 2017 and trip to Ohio. I don't mind that it isn't "an exotic place," I had one of the best months of my life there many years ago. Met some of the most wonderful people. Marisa, it sounds like you could really use this kettle! My favorite teas are loose leaf black teas: English breakfast, Earl Grey, Darjeeling and Assam. Happy travels! Suz, a collection of teas is just the best present in the world! I do love my tea! I have a friend who is a tea lover and thinking she would love this travel kit as a gift. Thanks for linking up with Blogging Grandmothers. Okay, time to admit something major. I have never had tea in my life. Or coffee. (Do you still like me?) I am a one-hot-beverage kind of guy, and that is cocoa. Weird, huh? However (and you don't need to include me in the giveaway), while I was in the U.K. these past few weeks, I fell in love with the electric kettles! So good for so many things! Love your tea travel kit. My cocoa kit is smaller by along the same idea. My own wonderful Pernigotti cocoa and sugar. I can always buy milk wherever I go! Candace, that's so nice of you to think of her. I'm sure she'd love it! David, that's okay! My husband never liked hot beverages (even hot cocoa) until he hooked up with me, and only in recent years has he really taken to tea and has still never tasted so much as a sip of coffee. So, you see, I don't hold that sort of thing against a guy! I love that you ave a cocoa kit! This tea travel kit looks awesome! What a great idea, thanks for sharing. Thanks, Cecilia! I'm sure enjoying it! We love to cruise so it would be perfect for the cabins. Thanks, Susan, it really would! What a lovely idea. I always take my favorite teas when I travel. Thank you, Mary! I'm glad to hear you take your favorites along, too. Susan, how I envy you! You and your sisters won't mind if I tag along, will you? :-) When I was in the Lake District, I was so busy seeing my mother's family's home, etc, that I never got around to Beatrix Potter's. I take mine on our trips...or I did until it finally died a few months ago...and have taken it on a cruise too! We always take our own teas. A wonderful giveaway! Thanks for linking to Tuesday Cuppa Tea! Ruth, I might have known YOU would "have tea, will travel"! I am not eligible for the really nice tea kit. Oh well, good thing that I am happy with coffee, I hope that is not swearing. Kathleen thanks for commenting. And, yes, that kinda IS swearing! :D But, seriously, you *could* use the kettle for coffee, if you do pour-over or French press. I thought I was picky about my tea, but you beat me. That is such a good idea to travel with your own kit! Thanks, ARC, Sugar! One can never be too picky about one's tea! I would love to have a way to make tea while traveling! I am excited that the carafe does not have a plastic interior. You have such good taste! Thank you, Sister in the Mid-west! Enjoy your stay in Arizona! I've been there a few times, and it was beautiful. Be sure to learn in advance about the different types of desert there and then be on the lookout for them. I can see a real need for this in my life. It makes me want to travel. Thank you for sharing at #thursdayfavoritethinggs! What a great give away. Lovely! I think this set would like a trip to the beach on the Oregon Coast... and would be happy to take it there. I could relate to everything you were saying...I don't want my tea brewed in a pot that's made coffee.. I don't like that I have to wait until breakfast to have my first cup.What a great idea to have this travel kit....and wonder why I didn't think of it myself. Thanks ever so much for the great opportunity to possible get one. Marilyn, thank you! Yes, and even when you're not traveling ... I'm thinking of carrying it with me when I visit friends in town who don't have proper tea making stuff! Oh, dear Lily, I hope you get to take that trip -- it sounds wonderful to me! Hope you're staying warm and cozy and will have a wonderful 2017. Cathy, I'm glad you like my idea! And it would be perfect for Minnie Driv'r. It must be such fun staying in Minnie! Such a neat little kit! Would love to win but leery about exposing my email publicly. And no way would I ever use a coffee pot in a hotel room, not even for coffee! Thank you for partying with us at Blogging Grandmothers Link Party. I shared your post on my social media sites. Grammy Dee, thank you so much for sharing my post on your social media! Much appreciated! I understand about the email address, which is why I and many others who have a need to put our email address on our blog write the email address in a way that helps prevent it from being harvested by spambots. But I know how to contact you (contact form), so you're in! That looks like an amazing travel kit! I'm going to check out the kettle know! ps- thank you for your kind comments on my blog! Thank you, Deanna. And the kit is easy to put together; I've linked to everything you need! It's such a great little kettle! Jean, this travel kit sounds very nice, Thanks for sharing with Hearth and soul blog hop. tweeting. Thanks, Swathi! AND for the tweet! I'm definitely sharing this post with a friend of mine who always takes a collection of teas when she travels but does use the coffee maker to heat her water. She will love it. I just love your Tea Travel Kit, I sometimes feel I am a Tea Snob. Thanks so much for sharing this awesome post with us at Full Plate Thursday. Have a great week and hope to see you again real soon! Karen, thanks so much. Maybe your friend will win the kettle! Once she tries it, she'll never go back to heating her water in the coffee maker! This post makes me so happy because I always take my own tea maker when traveling! Once when I did it as "carry on" I got a few curious looks from the TSA.... Hey, a girl needs her tea! That's right, Pamela, a girl needs her tea! Glad you like the post! Thanks, Bridget! I love finding fellow tea snobs! I bring a travel kettle when I do road trips. Just recently, I brought it along to LA and Vegas, and it was so useful; and definitely comforts me inside out when I have a cup of warm water in the chilly mornings. Thanks, tigerfish. Good to know others like to travel with kettles! Caitlin, I've heard hot tea is very popular in Jordan but that they serve it very sweet. 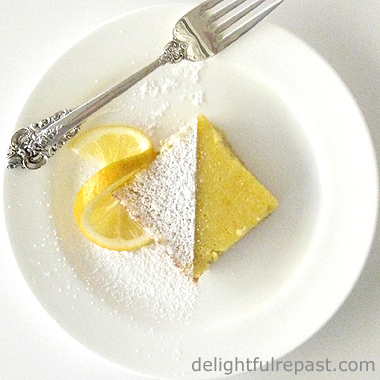 If, like me, you don't like it sweet, you might need to make your own. Jean, what a great little travel kit. I would take it with me on a holiday to the beach. Any Beach, as long as it's warm. Heck, any Beach as long as I can hear the waves crashing! I miss living by the ocean. Bruce and I went to Mexico several years ago and our hotel was right on the beach with the patio overlooking the ocean. Every morning we would get up and make our own hot beverage, sit on the patio and greet the day. Is there anything more beautiful and calming than a cup and the waves? At the end of the night we would meet back on the patio with our cup of tea and listen to the waves and relax and talk about our day. It was the best vacation I've ever taken and we had such a great time. Thanks, Nikki. Your description of that vacation just gave me a sort-of mini-vacation! We once stayed in a hotel room that was actually over the water. Standing on the balcony was like standing at the rail of a ship. They supplied earplugs in case you were bothered by the waves crashing at night. We didn't use them! Nikki, yes, it's perfect for that! And I love your enthusiasm for tea, RCR! Thank you for the opportunity to enter the giveaway. Hugs to you! Oh, sweet Stephanie, how I would love to be taking my tea kit to Ontario! I would love to visit Stratford again, see several plays there, then move along to Niagara-on-the-Lake, see a few plays there, maybe go to Niagara Falls. Whatever you do, you'll have a lovely time! Love the idea of this wonderful travel kettle, Jean. As you can imagine, I hate to be too far from a cup of tea and this would ensure I never was! Thank you for sharing with us at Hearth and Soul. So true, April! That's the thing with me as well. So it's reassuring to have my travel tea kit with me! What a perfect little set up for your travel. though I drink coffee (pour over) in the morning, I must have my afternoon cup of tea. I like your little bag and it's perfect (and stylish) for your intended use! I would love to take this with us on trips. it would be great to be a little pampered early in the morning. Thanks, podso. And, of course, you can use it for your pour-over coffee in the morning as well as your tea in the afternoon! Yes, Vickie, that early morning pampering is soooo nice! This would save me from taking the rather large electric pot I have now. fingers crossed!!! EGA, I'm so glad you entered! I was hoping you'd see this. I'm looking forward to your next Earl Grey review. 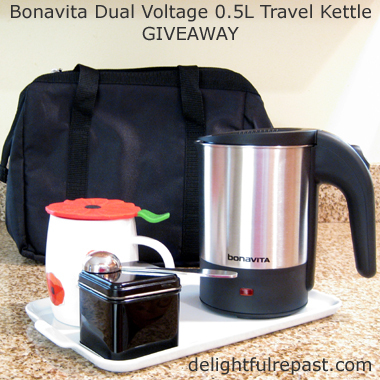 *Giveaway Winner Announced* - The winner of the Bonavita travel kettle, by random drawing, is Lorrie. Lorrie, as soon as you send me, delightfulrepast at aol dot com, the name, address and phone number (required by shipper), Bonavita will send the kettle. Congratulations! If I don't hear from the winner of the random drawing by 11:59 am Eastern time Sunday, January 15, another drawing will be held and new winner selected from among the original entrants (those who commented before the giveaway deadline). This was fun! Watch for more giveaways here at Delightful Repast! In the meantime, follow me on Google, Pinterest and Twitter. You can even use the Follow Me By Email button in the right column. I just subscribed to your blog and will get the email when you post. After 40 years in the US I still bring my tea from Germany. I bring black and herbal teas . I travel very light these days but I love your little travel kit. Gerlinde, I would do the same. It would be like a little taste of home! Thank you for subscribing. I don't know quite how that works, so let me know if you get the email next week.